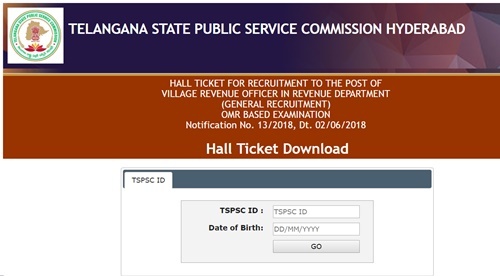 TS VRO Hall Ticket 2018 Download: Telangana State Public Service Commission (TSPSC) will be conduct the Village Revenue Officer examination on 16th September. Applicants can get the admit cards from the TSPSC official website, tspsc.gov.in before going to the examination. Hall ticket/ admits card is the most required and important document to proceed with the examination. Candidates going to appear for the Telangana VRO prelims examination must download and preserve the VRO Hall Tickets safely. The admit cards contains the information of examination center details and examination timings, date printed on it. After downloading hall ticket, candidates can once check all the details from it. Here in this article, we have explained the complete guidelines to download TSPSC VRO admit card, and other important details were explained for the complete awareness of aspirants. Telangana State Public Service Commission is the state level government organization that regulates various operations in the state. The organization issues various recruitment notifications depending on the requirement. Candidates aiming to get state government jobs can stay checking the official website, tspsc.gov.in. The Telangana PSC has recently come up with 700 Village Revenue Officer (VRO) posts. Aspirants seeking to get state government jobs in the state of Telangana have applied for VRO posts from 8th June to 2nd July. All the candidates applied for the TSPSC VRO posts will have different levels of the selection process, preliminary examination, mains examination, and interview rounds. Candidates applied for TSPSC VRO posts will have to appear for the preliminary examination on scheduled dates. To attend the examination, the applicants essentially required to download TSPSC VRO Admit Card 2018. Candidates can check complete details of TSPSC VRO admit card 2018 from the following. TSPSC VRO Hall Ticket is the most important document to carry to the examination. Candidates applied for the VRO posts and attempting the examination on 16th September have to download the hall ticket for must. The TSPSC VRO Hall ticket 2018 link will be activated on TSPSC official website, tspsc.gov.in from September 1st week. After downloading the hall ticket candidates can check the details of examination center, date, and timings of the examination. And also, the TSPSC will print the details of candidate name, date of birth, candidate’s photograph, signature and other details. Also, instructions for candidates will be mentioned on the admit card. Hence candidates can clearly check all the details once after downloading it. Hopefuls attending the VRO examination must carry any valid identity proof along with the hall ticket. Verification of hall ticket, as well as the identity card, will be done at the corresponding examination centers. Hence candidates are instructed not forget the hall ticket and ID proof while going to the exam. All the competitors going to take the examination can avail their hall tickets from the TSPSC Official portal, tspsc.gov.in. 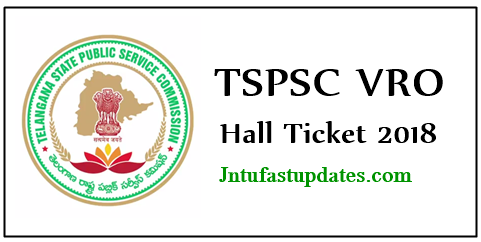 Search the TSPSC VRO Hall Ticket download link in organization website. Check the information in Telangana VRO Hall Ticket 2018. Sir after finishing my vro exam I lost my Hall ticket, pls help me out now from where can I download pls suggest.